I live in Glasgow, “raining champion of the UK“. At 170 days of rainfall per year, we beat all the other sodding wet sods in this famously wet country. Last week, however, was truly beautiful. Not a drop for a good week: light, blue sky, sun-burnt Scots. Of course that all came crashing down on Saturday with torrents of rain. All things must pass. In such conditions there is little that I enjoy more than lounging in bed all day with warm music playing, sipping coffee and reading a book about some sort of weird smuggling. The rarer, the stranger, the more elite the commodity the better. Obviously I study antiquities smuggling (ticks all the boxes), but I see so many parallels with other ‘weird stuff’ smuggling that I can’t resist those worlds as well. I’m interested in the motivation and the obsession of collectors of these things, the justifications of intermediaries and dealers, the impact on the ground at source. I am fascinated by the convoluted paths that connect totally different worlds. I am drawn to the idea of destruction for possession of beauty (and drawn to challenging that mentality). Why do people do all this? 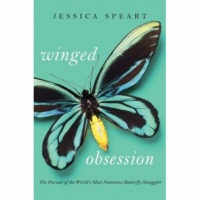 That’s where Winged Obsession by Jessica Speart comes in. It was a rainy smuggling Saturday and butterflies were my target. 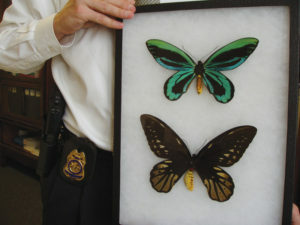 I fluttered on to this topic with very little background: a few photos of a seizure of Bolivian butterflies being smuggled in a Styrofoam cooler sent by a friend, and impression that, like antiquities, rareness and beauty probably mattered more to many butterfly collectors than the law. “Maybe”, I thought as my coffee brewed, “it’s kind of a Pokémon mentality. Gotta collect them all”. I wrote that down on a piece of paper under the heading “typologies of collecting rare and illicit goods”. There has to be something in that. Always the academic. 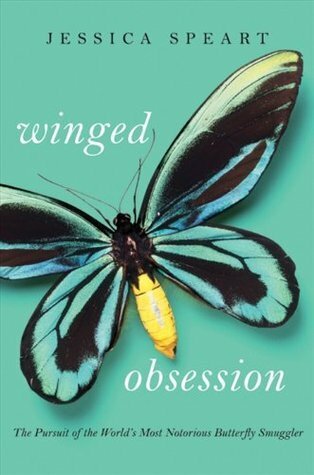 Winged Obsession follows the work of a US Fish and Wildlife special agent as he goes undercover to eventually arrest Hisayoshi Kojima, a Japanese citizen who operated out of California, for butterfly smuggling. The USFW agent was the book’s central character, clearly having contributed a lot of info about the case to the author, and Kojima took on a strange supporting role mostly as “creepy internet weirdo” (Kojima really was a Skype creeper). There were no butterfly collectors in the book at all and only casual mention of butterfly suppliers/poachers, mostly from previous cases in the US; nothing from those two ends of the chain. This book was all about the middle: the intermediary Kojima who bought from poachers and who thought he was selling to a US based dealer (the special agent) who then sold the butterflies on to customers. Although I would have loved to read collector quotes about obsession so that I could slot them in to various other narratives about collecting that I am studying, this eye on the middle kept the book focused on the story and that’s totally fine. I can drum up some other history of butterfly collecting, this book is about a smuggling sting. The narrative flows well and it kept my attention for a full rainy day in bed. I read it cover to cover. Don’t expect deep analysis or anything academic: this is a crazy story first and foremost. A light, amusing introduction to butterfly and insect smuggling for when you don’t want to wade through Google Scholar to find something stale and citeable. Also to be taken with a grain of salt, Kojima told the USFW special agent that he had paid off a museum worker in a Latin American country to pack and send butterflies using museum credentials. I don’t fully believe this and I don’t see how a museum would be able to get around CITES, but without details I marked that one as potentially interesting as a smuggling pathway. Corruption of professionals is interesting. Really though, fella did most of his smuggling by sending things in the post. No one checks the post really. I think that’s how everyone smuggles most everything. I wrote that down too. Importantly, Winged Obsession got me excited about August. Thanks to a grant from the Carnegie Trust, I’ll be traveling to the University of Cape Town’s Centre of Criminology to start up some research with Dr. Annette Hübschle-Finch who studies environmental security and organized crime, with a focus on illegal markets for wildlife products. I think we can get something going on rare, elite, illicit commodities smuggling and we’ve got 2.5 weeks to brain storm up a grant proposal. Fingers crossed. All told, the book was low on the mechanics of the smuggling networks or players and high on the experiences of the agent, but I enjoyed it. More importantly it got me thinking in a way that has previously resulted in published articles (e.g. Collectors on illicit collecting: Higher loyalties and other techniques of neutralization in the unlawful collecting of rare and precious orchids and antiquities, by Simon Mackenzie and myself in Theoretical Criminology, Open Access). Maybe I need more books like this. Maybe I need to do more real work on insects. Sigh. To Google Scholar with me.